A Swiss company on Wednesday is set to become the world’s first to commercially remove carbon dioxide directly from the atmosphere and turn it into a useful product. 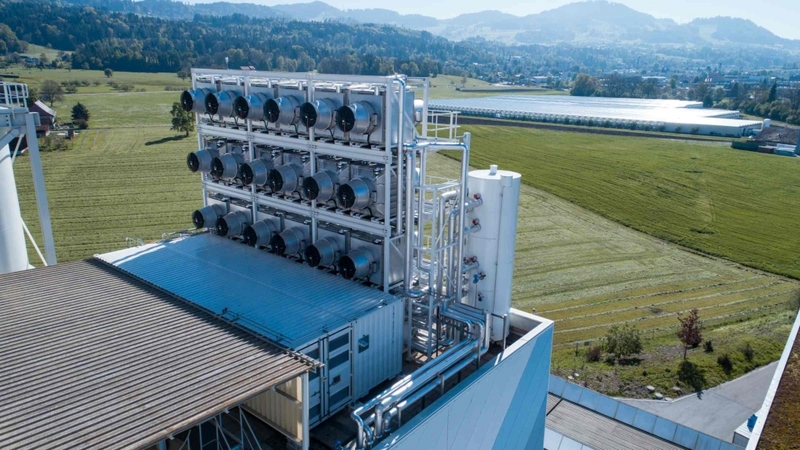 Climeworks, which will begin operations at a facility near Zurich, Switzerland, plans to compress the CO2 it captures and use it as fertilizer to grow crops in greenhouses. The company wants to dramatically scale its technology over the next decade, and its long-term goal is to capture 1 percent of global annual carbon dioxide emissions by 2025…. The Climeworks direct carbon capture plant in Switzerland removes carbon dioxide from ambient air. …Carbon removal and storage coupled with drawing down fossil fuel use is called “negative emissions.”…. ….The technology to remove carbon dioxide from the atmosphere, including planting new forests and building facilities that directly remove and capture climate pollution from the air, is in its infancy. It has never been tried at a large scale, and nobody knows if it can be used worldwide to remove enough carbon dioxide to slow warming. the effect of extreme events can be buffered when species live in cooler than optimal environments, providing a kind of “climate safety margin” for those species. …the journal Philosophical Transactions of the Royal Society B created a special June issue to explore what is known on [behavioral, ecological and evolutionary impacts of extreme climatic events] and pioneer new approaches to this challenging and rapidly expanding field of study…”Changes in variability can have very different consequences on population dynamics for both animals and plants,” Jenouvrier says…..
…A change in temperature variability leads to more frequent warmer and colder events while a change in the temperature mean increases the occurrence of warmer events but decreases the occurrence of colder events. The researchers found that changes in the variation of ocean temperatures had a threefold effect on the growth rate of the albatross population compared to changes in just mean ocean temperature. Increasing variation of ocean temperatures — temperatures that range well below or above the optimum for the species — leads to population decline, while increasing the mean (average) of ocean temperatures result in population increase. … In other words, the effect of extreme events can be buffered when species live in cooler than optimal environments, providing a kind of “climate safety margin” for those species. “In this case, the historical mean (or average) of sea surface temperatures was lower than the optimal temperature for this species,” explains Jenouvrier. “If the mean temperature warms, these albatrosses will experience temperatures that will be more often at or near the optimum range for the species, so these changes in mean will buffer the negative effects of the extreme warming events.” However, even for those species that do experience a buffering effect from the climate safety margin, it’s likely to be only temporary as future temperatures continue to rise beyond their optimal temperature range, she adds…. Martijn van de Pol, Stéphanie Jenouvrier, Johannes H. C. Cornelissen, Marcel E. Visser. Behavioural, ecological and evolutionary responses to extreme climatic events: challenges and directions. Philosophical Transactions of the Royal Society B: Biological Sciences, 2017; 372 (1723): 20160134 DOI: 10.1098/rstb.2016.0134. If you want to plant a pine tree that might survive the climate upheavals that are already remaking northern Minnesota’s boreal forest, where should it go? Scientists from the Nature Conservancy and elsewhere now think they know. This summer they’re embarking on a project to plant 400 acres with cold-loving evergreens like jack pine and tamarack in carefully selected “conifer strongholds” — places that they predict will stay cooler or wetter or have better soil, increasing the chances that a few of each species will survive for the next generation as Minnesota grows warmer. …The aim is to preserve northern forest species — not just the trees but also the mosaic of plants and animals that rely on them — to maintain biodiversity. Now, climate change is forcing a different kind of evolution on the southern, most vulnerable, edge of the boreal forest. The giant, long-living pines are disappearing, replaced by more southern species like red maple as tree species across the country move in response to rapid changes in temperature and moisture brought on by 100 years of rising carbon levels in the atmosphere. A study of 86 eastern tree species published last week by Purdue University scientists found that many [tree species] have already migrated west in response to increased rainfall in the central part of the country, and north in response to higher average temperatures. ….If that’s what happens [stay within 2C], then the conifer stronghold will work, he said. But if carbon emissions and climate change continue to accelerate, then in time, northern Minnesota will instead look a lot like Kansas, Frelich said, and no boreal species will survive long-term. Cornett hopes to provide conifers more time on the Minnesota landscape no matter what happens. She and foresters from the University of Minnesota and elsewhere have identified 30 such strongholds, totaling 400 acres, in the forests north of Duluth and in the St. Louis River watershed, where they will plant seedlings this year. Next year they plan to plant 50,000 more at other sites in northeast Minnesota. …The conifer stronghold data comes from a much bigger effort by the Nature Conservancy to map and identify areas across the national landscape that are most likely to promote biodiversity in the future. In short, rather than tracking and protecting places because of the species that are there, it focuses on geology. A limestone valley, for example, will be home to a different set of species than a granite mountain no matter what the climate. Overheated cities face climate change costs at least twice as big as the rest of the world because of the ‘urban heat island’ effect, new research shows. …The urban heat island occurs when natural surfaces, such as vegetation and water, are replaced by heat-trapping concrete and asphalt, and is exacerbated by heat from cars, air conditioners and so on. This effect is expected to add a further two degrees to global warming estimates for the most populated cities by 2050. Higher temperatures damage the economy in a number of ways — more energy is used for cooling, air is more polluted, water quality decreases and workers are less productive, to name a few….Although cities cover only around one per cent of Earth’s surface, they produce about 80 per cent of Gross World Product, consume about 78 per cent of the world’s energy and are home to over half of the world’s population. Measures that could limit the high economic and health costs of rising urban temperatures are therefore a major priority for policy makers…The cheapest measure, according to this modelling, is a moderate-scale installation of cool pavements and roofs. Changing 20 per cent of a city’s roofs and half of its pavements to ‘cool’ forms could save up to 12 times what they cost to install and maintain, and reduce air temperatures by about 0.8 degrees…. Under a dual onslaught of global warming and localised urban heating, some of the world’s cities may be as much as 8C (14.4F) warmer by 2100, researchers have warned. Such a temperature spike would have dire consequences for the health of city-dwellers, rob companies and industries of able workers, and put pressure on already strained natural resources such as water. The projection is based on the worst-case scenario assumption that emissions of greenhouse gases continue to rise throughout the 21st century. The top quarter of most populated cities, in this scenario, could see temperatures rise 7C or more by century’s end, said a study in the journal Nature Climate Change. A tax of $100 a tonne would be needed by 2030 as one of a series of measures to prevent a rise in global temperatures of 2C. In a report by the High Level Commission on Carbon Prices, which is backed by the World Bank and the International Monetary Fund, they suggest poor countries could aim for a lower tax since their economies are more vulnerable…. The meltdown, following an extra warm Arctic winter, will have an impact on coastal communities and permafrost. “It’s another sign that the Arctic is unraveling. We had heat waves in the central Arctic last winter, record-low winter sea ice coverage, and even periods of ice retreat when it should be growing,” said Mark Serreze, director of the National Snow and Ice Data Center. The Arctic’s record-warm winter has allowed thousands of square miles of sea ice off Alaska to melt more than a month early, leaving the shoreline vulnerable to waves and exposing dark ocean water to absorb more heat from the sun…As of May 24, the ice cover on the Chukchi Sea had melted away from the shore along a 300 mile stretch, from Point Hope all the way to Barrow, the northernmost town in the United States. Satellite and radar data show the ice-free area totaled about 54,000 square miles. The huge area of open water off the coast is something you would normally see in early July, said Mark Serreze, director of the National Snow and Ice Data Center. The rapid disintegration of the Chukchi Sea ice is an “exclamation point” on a remarkable series of rapid fire Arctic changes, he said. “It’s another sign that the Arctic is unraveling. We had heat waves in the central Arctic last winter, record-low winter sea ice coverage, and even periods of ice retreat when it should be growing. These extremes are moving from place to place,” Serreze said. The Arctic climate change underway is caused by the buildup of heat-trapping greenhouse gases. …The rapid recent decline in ice coverage and thickness has led researchers to believe that most of the Arctic Ocean will be free of ice in the summers as soon as the mid-2020s. NSIDC researcher Julienne Stroeve, currently based at University College, London, said at a recent science conference that each of the last 10 years saw record-low sea ice coverage, and that there were seven months of record-low sea ice conditions during 2016, setting the stage for a Chukchi Sea meltdown. Sea ice conditions were so unusual in late 2016 that NSIDC lead scientist Ted Scambos called it a black swan event in December, after reporting record low ice extent in the Arctic and Antarctica, far below natural historic variations. In mid-November 2016, much of the Arctic—spanning an area as large as the lower 48 states—was 30 to 35 degrees above average. …a large part of the world’s coast is Arctic, and that erosion, on average, is taking a 1.5-foot bite out of that coastline each year, said Michael Fritz, a polar and ocean researcher with the Alfred Wegener Institute in Potsdam, Germany. Despite having increased human wellbeing in the past, intense modifications by multiple and interacting pressures have degraded ecosystems and the sustainability of their goods and services. For ecosystem restoration to deliver on multiple environmental and societal targets, the process of restoration must be redesigned to create a unified and scale-dependent approach that integrates natural and social sciences as well as the broader restoration community, say researchers…. From Abstract: …This modest success rate can partly be attributed to the fact that the catchment filter is largely ignored; large-scale pressures related to catchment land use or the lack of source populations for the recolonisation of the restored habitats are inadequately considered. The key reason for this shortfall is a lack of clear objective setting and planning processes. Furthermore, we suggest that there has been a focus on form rather than processes and functioning in river restoration, which has truncated the evolution of geomorphic features and any dynamic interaction with biota. Finally, monitoring of restoration outcomes is still rare and often uses inadequate statistical designs and inappropriate biological methods which hamper our ability to detect change. Biological impacts of seawater pH have implications for the use of foraminifera as paleoceanographic indicators. … For the study, published in the journal Scientific Reports, scientists raised foraminifera — single-celled organisms about the size of a grain of sand — at the UC Davis Bodega Marine Laboratory under future, high CO2 conditions. These tiny organisms, commonly called “forams,” are ubiquitous in marine environments and play a key role in food webs and the ocean carbon cycle….UC Davis scientists found that under high CO2, or more acidic, conditions, the foraminifera had trouble building their shells and making spines, an important feature of their shells…. [and] showed signs of physiological stress, reducing their metabolism and slowing their respiration to undetectable levels. This is the first study of its kind to show the combined impact of shell building, spine repair, and physiological stress in foraminifera under high CO2 conditions. The study suggests that stressed and impaired foraminifera could indicate a larger scale disruption of carbon cycling in the ocean…. …As a marine calcifier, foraminifera use calcium carbonate to build their shells, a process that plays an integral part in balancing the carbon cycle. Normally, healthy foraminifera calcify their shells and sink to the ocean floor after they die, taking the calcite with them. This moves alkalinity, which helps neutralize acidity, to the seafloor. When foraminifera calcify less, their ability to neutralize acidity also lessens, making the deep ocean more acidic. …”That acidified water from the deep will rise again. If we do something that acidifies the deep ocean, that affects atmospheric and ocean carbon dioxide concentrations on time scales of thousands of years.” [Catherine] Davis said the geologic record shows that such imbalances have occurred in the world’s oceans before, but only during times of major change. “This points to one of the longer time-scale effects of anthropogenic climate change that we don’t understand yet,” Davis said. …strong winds periodically push nutrient-rich water from the deep ocean up to the surface– Upwelling supports some of the planet’s most productive fisheries and ecosystems. But additional anthropogenic, or human-caused, CO2 in the system is expected to impact fisheries and coastal ecosystems…. UC Davis’ Bodega Marine Laboratory in Northern California is near one of the world’s most intense coastal upwelling areas. At times, it experiences conditions most of the ocean isn’t expected to experience for decades or hundreds of years. Abstract: ….We cultured a globally important calcifying marine plankter (the foraminifer, Globigerina bulloides) under an ecologically relevant range of seawater pH (7.5 to 8.3 total scale). Multiple metrics of calcification and physiological performance varied with pH. At pH > 8.0, increased calcification occurred without a concomitant rise in respiration rates. However, as pH declined from 8.0 to 7.5, calcification and oxygen consumption both decreased, suggesting a reduced ability to precipitate shell material accompanied by metabolic depression. Repair of spines, important for both buoyancy and feeding, was also reduced at pH < 7.7. The dependence of calcification, respiration, and spine repair on seawater pH suggests that foraminifera will likely be challenged by future ocean conditions. Furthermore, the nature of these effects has the potential to actuate changes in vertical transport of organic and inorganic carbon, perturbing feedbacks to regional and global marine carbon cycling. The biological impacts of seawater pH have additional, important implications for the use of foraminifera as paleoceanographic indicators.